Symphonic, highly arranged speed metal with class, Rhapsody deliver the hard liquor metal with a twist of lemon and coke mixed in (the opera and orchestration styles they implement) to help the sound go down better. 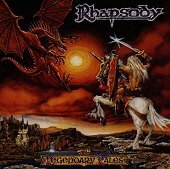 Legendary Tales and Symphony of Enchanted Lands are both prime examples of the cutting edge metal sound Rhapsody is capable of. Instead of re-treading the same old metal that everyone else is doing, they expand beyond it and bring in plenty of far off influences that both enrich and liven up the sound. Strong willed, hearty, and still man enough to show a tender side, Legendary Tales and Symphony of Enchanted lands are two metal albums you shouldn't pass on if you're a fan of metal but tired of the same old album being regenerated by all the bands out there. I'll give them both a C.